There are currently two exhibitions in London, which highlight gender-disparities in the art world. The Saatchi Gallery begins 2016 with its first all-female exhibition, ‘Champagne Life’; far from the glamour of Chelsea, in Wapping’s abandoned Hydraulic Power Station, a small display of photographs by Annie Leibovitz opens. These exhibitions, supposedly wrought from the same feminist ideologies, could not be more different in their approach. Despite its all-female cast, the Saatchi exhibition lacks cohesion.The show opens with six large canvases by Julia Wachtel, including the work ‘Champagne Life’: each juxtaposes a grainy black and white blown-up photograph featuring celebrities or scenes of violence with gimmicky colourful cartoon figures. While works such as Wachtel’s make bald statements about consumer culture and celebrity lust, nearly all the subsequent artworks fail to provide any further commentary. There are personal, introspective works, such as Seung Ah Paik’s room-filling drawings of her own body parts: unconventionally large and abstracted, they give the impression her body is craning in to observe itself. There is Maha Malluh’s collection of burnt pots representing thousands of cooked meals, now arranged like wallpaper across one long wall. Jelena Bulajic’s works are immense portraits of people she has met in her everyday; intensively scaled-up and focused in, every wrinkle and contortion of the face is visible and they candidly stare back at the observer. 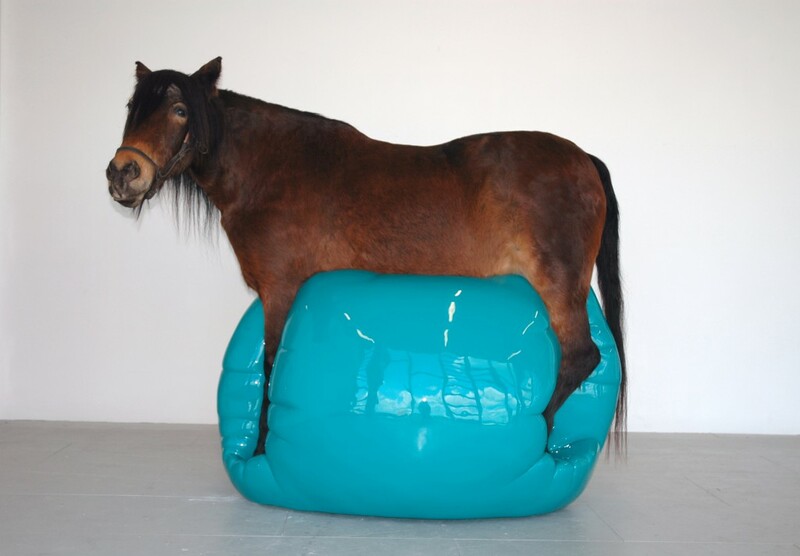 Sohelia Sokhanvari makes works that are political and fantastical: here, a taxidermied horse is marooned on a garish blue jesmonite ‘blob’, creating a complex metaphor about East and West. The exhibition represents countless geographies and topics, and mediums from pencil to photography to wax sculpture. In typical Saatchi exhibition style, commentary is minimal to none. Although many pieces are visually striking, their relation to one another is indecipherable, leaving the works floating without context. They are connected because they occupy the same space, because they are contemporary and now, because they were made by women, but that’s it. By the final room, the theme of ‘Champagne Life’ is lost, causing speculation that the title in fact has more to do with the show’s sponsor, Champagne brand Pommery. The collection on display is an extended version of a photography project that began more than 15 years ago and was first displayed in 1999. It was revived by UBS, who have commissioned 22 new portraits for this exhibition. They are pinned to a long board stretching across one side of the room. Adjoined by three large screens, a square is formed within which the viewers are encouraged to sit, as the screens present a rolling slide of hundreds of photographs of women taken since 1994. When Leibovitz was asked why she chose to return to this project rather than start something new, she simply said: ‘There were portraits of people that I wanted to photograph – it’s an endless subject.’ Fifty new portraits will be added over the course of its 10- country tour. In a hint of what’s to come, three post-it notes form a footnote at the end of the new photos labelled ‘Marina Abramovic’, ‘Serena and Venus’, and ‘Malala’. Where Leibovitz’s touring installation speaks meaningfully about the progression of gender inequality and reflects on female representation in art and media, the Saatchi exhibition seems little more than a gesture, jumping last-minute on the feminist bandwagon. ‘Champagne Life’ is at the Saatchi Gallery, London, until 3 March. ‘Women: New Portraits by Annie Leibovitz’ is at the Wapping Hydraulic Power Station until 7 February. How did the Scottish women who went to progressive art schools fare in a reactionary art world?